​College goals: keep my scholarship, pass my classes, earn a degree. No one said anything about falling in love at first sight, though, honestly, I wouldn't have believed them if they did. Then Adam walked into my life and I couldn't deny it. Love at first sight is real. Like really real. 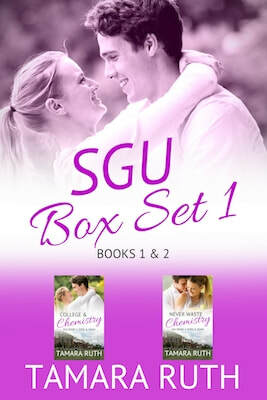 This box set contains the first 2 books of the Smith and Guy University series. Edee Davinroy had a plan: focus on her grades. Then she met Adam and fell hard. Dating her dream guy is awesome, if a little nerve wracking. A hostile professor, a backstabbing friend, an ex with a grudge, and exam season aren't going to make things easy though. Juggling isn't Edee's strong suit. When forced to make a gut-wrenching choice, Edee has to face her past and decide if love is worth all. Christmas break gets interesting for Edee and Harper when they fly off to other sides of the country. 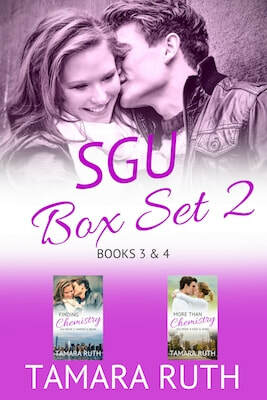 This box set contains books 3 and 4 of the Smith and Guy University series. Harper expected a boring winter break until her mother announced they were off to New York. Updating her social media status results in an even better surprise: her secret crush asking to see her. But Christmas at the far end of Long Island turns out to have quite a few perks: namely Brian. Edee's quiet Christmas at home imploded with the midnight arrival of her biggest frenemy. To make matters worse, she's off to meet Adam's family for New Year's. Romantic moments go a sideways when family gets involved. Plus Adam has a few surprises to share. Can they overcome the odds against them?